I met Feral Kitten Girl two years ago. I know this because I got Daisy two years ago, and when Daisy joined the Farmily, I began spending every morning at the corrals, milking her. Not long after, I noticed a very small, very beautiful cat skulking around. She was a soft gray and cream and had huge sapphire eyes. She was stealthy, skinny; a teenage runaway living on the streets. I began leaving a dish of Daisy’s fresh milk behind after I finished milking each morning. As I walked home, I’d glance back and see Feral Kitten Girl hungrily lapping it up. She began showing up (or showing herself) when I arrived at the corrals, crouching at a remove, waiting for her milk. One morning, I filled her bowl while I was in the middle of milking – instead of after I was finished – and set the dish a few feet from me. As I continued to milk Daisy, Feral Kitten Girl crept up and drank beside me. Soon she was greeting me when I arrived in the mornings, even rubbing her body against my legs as I sat milking Daisy. Though she was far from tame, she let me pet her and hung out with me whenever I was down at the corrals, which had become her home. I began feeding her dry cat food along with milk each morning, but she still hunted, too. One day, I peeked into the nest she had made in the haystack and saw five dead mice arranged in a perfect circle, like the spokes of a wheel. Last summer, she disappeared from the corrals. I knew she had gone somewhere to have another litter ~ the corrals weren’t quiet enough with the three now-grown boys running around and the lingering threat of raccoons. I suspected she had chosen some abandoned corrals nearby; there, she would find shelter, lots of leftover straw for nests, and peace, as no one had lived there for years. I didn’t see her for a few weeks and then, one day, she showed up at my house. She had never been to my house before ~ all our interactions had taken place solely at the corrals ~ but here she was, obviously nursing. I set a bowl of food outside for her and sat on the step as she ate. She began showing up at my door every day; then twice a day. She’d feast on an easy meal, drink fresh milk, lounge beside me in the sun. Sometimes I would place her food dish inside, leaving the door open, and soon she was wandering around inside my house, checking it out, getting comfortable. And then, one day, she brought her kittens. Four tiny, fluffy kittens of the highest magnitude of cute imaginable. What a beautiful cat! Thanks for sharing and I can’t wait to hear Eli’s reaction to such a pretty girl hanging around with his family! what a gorgeous cat! I’m so glad you made friends with her and her sweet little ones. Ah Shreve, after reading you for years and years I still say you have one of the more interesting blogs on the web. wow those blue eyes are mesmerizing! so pretty! Oh I can’t wait for the next story! this cat is just a beauty those eyes and the color..love to see pictures of the kittens too! Oh my goodness, look at those eyes! She’s beautiful! What a good hunter! She reminds me of a siamese, her eyes are so blue. Beautiful story! yes, feral kitten girl is quite the lil huntress. my guess is that eli is probably above all the kitty hoopla, yawned and took a nap. What beautiful eyes she has. She trusts you. She has brought her babies to you to keep them safe. She knows you will protect them better than she can. Any chance Eli has more than a passing acquaintance with feral kitten girl? Possible paternity suit? I can’t wait until she presents you with her first mouse. Show her you treasure her gift. When my dog Caesar presented me with a mouse I praised him. But he saw me pick it up with a plastic bag and throw it in the trash can. He never gave me another mouse. In fact, he started playing keep away and once when I caught him swallowed it just to spite me. And what about Charly, isn’t he a tread to them? Uh-oh, is Eli the kitty daddy? I’m in love. She is gorgeous. And she’s obviously very smart; she found you. My husband and I had a stray come around the house once. She was extremely wary and wouldn’t let anyone near her. We would feed her every day and gradually she got to were we could pet her. One day she disappeared. I figured she had met her end with some of the local wildlife or had just moved on. About a month went by and I heard a cat meowing at the door. I opened it and there she was but she looked was skinny and bedragged. We coaxed her inside and gave her some warm milk and food. The next day she wanted out again so we let her out. She came back later that afternoon with a kitten and then later that evening with another kitten. We put the kittens in a box in the corner and she willingly hopped into it. The next morning, we found her dead outside of the box. She seemed skinny the night before, but otherwise healthy. I always think that she reasoned out that something was wrong with her and that she wanted to make sure her kittens were safe so she brought them to us. We still have both of them and they are an absolute joy. Dana ~ what a story! wow. Awwwww, cant wait for the next installment! Tears in my eyes as I read this. I LOVE this post! I lost 2 of my beloved cats just last year and this one reminds me of them. Wish I were there to take a kitten. Cannot wait to read more about her….what a story! Yay, loving this new saga! (Except the raccoon bit. :/) You really do have a way with wild animals, don’t you? I could “call” and “raise” you three feral cat explosion stories of my own. Is it possible that I have catnip in my DNA? I think everyone “has” cats…they just might not see them lurking under the bushes. A wonderful story! I can’t wait for the rest. My story is not so wonderful, beware. I worked for a while on a Dairy farm outside Hermiston, OR. I worked for room and board as the owners were poor and needed the help. I had left a carnival and needed lodging for the winter. I chopped wood, fed the cows and bull, my main task was killing feral cats. I am a animal lover and this came hard to me until I realized the cats had to go. Hermiston is a small city surrounded by farms of various types, the dairy farm I worked on was a non producing farm as the owners were elderly and the cost of milk was down. They raised the cows and steers for beef. You have a responsibility to your animals, do not dump them on others. HEY! are the kittens his? did he ask his babies-mama to move in and that’s how she came to your doorstep? or did she follow you one day? i look forward to part B of the feral kitty saga! I am not a cat person at all, but I like this cat. She is the most beautiful cat I have ever seen. She is a beautiful cat! Thanks for helping her! Wow, it’s not every day a Lynx point Siamese shows up at the doorstep! She’s so pretty – is she a talker? She’s purr-ty. Can’t wait for Parts 2, 3 and many more! Felines! Now you’re talking my subject! why? Y? Felyne? Get it? Ha! I’d totally forgotten about Eli! But do you think he’s the baby daddy, ginger is a dominant gene and the cute little kittehs don’t look at all ginger/torts. With that breed, the males are ginger and the females are tortishell (calico I think you call them here). To have a male torti or a female ginger is a genetic anomaly (although it does occur). I bet you already know all of this. How exciting, I miss my cats (had to surrender them when I moved to the USA). You have a very rich world Shreve, being filled with the life of other animals. Being catless I’m really noticing how much less Life is without them. How sweet! My own two formerly feral kittens are celebrating their 3rd bday today. There’s something soul-stirring about being able to connect with a wild animal and gain their love and trust. I have just aquired a feral kitten girl too!! She found me walking one morning in my neighborhood. Kitten fell out of a tree!! She started to meow so I scooped her up and imediately started to purr. Without second thought I continued my walk on home, kitty in one hand and my weights in the other. We had almost 1/2 a mile ahead of us. Kitten was hanging on until we reached my driveway. My dog, Kobe, heard us and began to bark, kitten squirmed and got out of my grasp. I tried to catch her without luck. I ran inside and filled a bowl with cat food. Kitten hung around and ate but she wouldn’t let me pick her up again. That evening around 10 I checked one more time. I gave out a “meow”, she meowed back!! I was so excited. I did it again and there she came running to me from across the street. It was like a Lassie movie!! We’ve had her 2 months now. I named her Neko. She’s been vaccinated, de-wormed, spayed and now loved! I’ve often wondered if we domesticated cats or they domesticated us. They seem to sense when it’s going to be safe to let their guard down with humans; her being able to trust you enough to bring the kittens around speaks volumes. My feral cat story happened when the kids were young. We’d been away on vacation with our dogs and when we got home, the Whippets chased away a feral cat from our garden shed. What we didn’t know was that she’d birthed a litter in there. Two days later, my girl dog would not come into the house and was walking around the base of the shed and whining. I went out to get her and heard the tiniest/weakest meow. Got on the phone with my husband, who confirmed the platform under the shed had a dead space and it possible something could have gotten into there. Spent twenty minutes on my belly in wet dirt, shovelling out some space around the cement bricks at the base. Found a three week old, dirt-encrusted,dehydrated kitten huddled there…best I could figure was that Momma Cat had been moving kittens out of the shed, dropped one and it had wriggled into the dead space and couldn’t get back out again. Cleaned the kitten, arranged for IV fluids and KMR to be dropped off at the house (am a vet tech) and began nursing the kitten back to health. Named her “Elsa” aka the lioness from ‘Born Free’ and told my husband that she was now ours. Three days later my husband called me upstairs. Seemed he’d been working in the back yard and heard more kittens. A peek into the neighbour’s shed revealed four more kittens, Momma Cat nowhere to be found. An epidemic of Feline Distemper was sweeping the town and the local SPCA was not taking in any new cats, it’s very possible the mom went off to die somewhere since we never did see her again. We did our best but only Elsa and one of her brothers survived their illness. We kept them both, Junior having passed on about a year ago. His 15 year old sister continues to share a bed with us; I like to think that she’s happiest being warmed by our bodies. Awww I LOVE barn cats!! 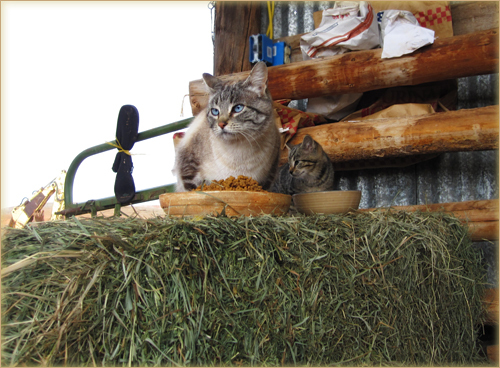 I always try to keep the population limited to 3 or so – but you have so little control over that when you factor in feral cats you can’t catch, predators, and dumped strays (EVERYONE assumes you need another barn cat if you have cow or horses and a barn). She’s a beautiful cat! To avoid inbreeding, I hope you’re able to spay and neuter her offspring. What a great story. Animals seem to know who has a warm heart for them. I had a similar exp. with a feral cat. We named him “Boy.” He showed up with his ribs showing, and you could tell someone and mistreated him. Took two years of slow feeding, almost getting to touch him. Then one day he showed up with a sore on his head, prob racoons. Then he quit eating. We knew we had to get him to a vet if he was going to survive. Because he wasn’t feeling good, we were able to catch him, and get him to the vet. The first thing the vet did, was put a warm towel over his entire body. This calmed him way down, so the vet could check him out. Three days at the vet, he came home and we kept him inside. He even got to the point of sleeping in our bed at night. He loved being in the house. He never went back outside after that. We were happy to have him. She is just so exquisitely beautiful… the Flicka of cats. So interesting that a little wisp of a wild animal can make life so rich. 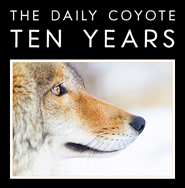 You’re a true “coyote-, dog-, cow-, bull-, cat-, goose- and horse-whisperer.” Thanks for giving us glimpses into some of your miraculous animal relationships. Loved all the stories of feral cats posted in this thread. p.s. – oops, left one out: Mike-Whisperer. Gorgeous cat and kitten/s, great story– waiting to hear WED (what Eli did), to say nothing of Charlie. Oh my goodness, that’s such a cool story. I found a feral at my house years ago. Her owners had moved and left her and although it took weeks of cajoling and patience, she slowly came around to trust us. We built her a shelter in the backyard and would find her in there more often than not, even carousing in the house with the other cats but never quite a house cat, always on the move out. I’m guessing Eli turned into the best kitty-daddy ever. And now I’m giggling because I’m imagining your cats on the Maury Povich show awaiting the DNA results to see if Eli is the father. Aw, I love little gray kitten girls. @ Dana, that is a GREAT story!! Love that. Shreve, that has to be the most beautiful barn cat I’ve ever seen! She looks very much like my cat Tara, who I miss achingly. Thank you for the kindness you’ve shown her. What a pretty kitty! I love her eyes! I have two kitten boys (how are now 14) from a farm in southern minnesota. My boys dad is feral, the hugest cat Ive ever seen and mom a house cat. My boys are the best, big and calm and nice to each other since they are brothers and they love their mommy. Im a wuse, cant deal with the casual way babies get killed on farms and ranches. I know its just life but I couldnt do it. I hope this batch gets some protection until they are grown enough to fight off a few of the preditors. What does Charlie think of kittens? Snack or new toy or baby to protect? Take care of them please. She is a beautiful cat and her little ones are so cute. I’m wondering how CHARLIE is dealing with a new kitty?! Ah, at last a character mentioned in passing gets her own well-deserved post! No surprise she learned to trust you; simply observing how you behaved around the corral would have given her evidence of that. Looking forward to the next chapter! Thanks to all the others who’ve shared their stories… @ I Hermit: my heart goes out to you, being stuck with a horrendous task like that. To my mind you did a necessary, even humane thing. I hope that no one gave you grief for it; it is those who abandoned those cats that deserve that. Gifted kitties! 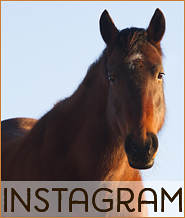 The shot on the bale is gorgeous – thank you. I have a smile a mile long & can’t wait for the next instalments! Having lost one of our cats in (we have another little one who schmoozes with our two labs and plays so well, she’s quite fine with being an only kitty we think) in late 2009 to an awful disease progression – we’ve agreed that our arms will open if a little one, or old one walks into our lives. Feral Kitten Girl is one of the most beautiful cats I’ve ever seen. Wow. If any of those kittens need a home, there’s one available here. Shreve, you must have a beautiful aurora around you for animals. They know your a kind person ready to help them but give them their freedom. Momma cat has the most gorgeous eyes. Anxious to hear and see the babies she brings around. First thought I had when I saw the first picture, was what beautiful eyes she had. Wow, what gorgeous eyes, and wow all the feral cat stories! Especially Dana! We had pretty much the same thing, not too feral as it was a cat the weird neighbors had gotten who ran away, then they abandoned her, then she had kittens in the woodpile next to our house. We coaxed her in finally and she shared her kittens with us, one of which we kept with her, before giving the others away. We had almost 18 years with her before she passed. WDED? Love it! He isn’t “Daddy” is he? Hum, interesting thought…. Can’t wait to read more. She IS gorgeous!!! WOW! How fortunate is she to have you in her life. :) Bless you!! Thanks for sharing this sweet story. Can’t wait to hear more. My heart aches because I don’t have another cat in my life (yet). The other posters have told such wonderful stories, both sad and sweet. Can’t wait for follow-ups on these kitties! Half of my garage has been turned into a “cat coop.” We put up wooden posts and chicken wire and gave the cats half of the garage – that we way could still park on the other side :D Yes, we leave one of our cars outside every night so that the 7 feral cats that I care for can have a warm bed, food, water, etc. every night! They are all fixed except one who absolutely refuses to be trapped. He lets me pet him now so I’m keeping my fingers crossed that I’ll get him soon. I also used to volunteer at a Trap/Neuter/Return program for feral cats. Lots of stories there about cats who escaped their traps in the vet office and went HAYWIRE!! We eventually got them sedated so all ended well. She is beautiful Shreve..and her eyes..mesmerizing..and so the farmily grows..
She’s a beauty. My own feral kitten girl became my close companion for 15 years. The bond that can develop is amazing. Hurry, Shreve! I can’t wait for the next installment! My kitten story involves a cat that doesn’t belong to me – Piper, AKA The Dark Lord, He Who Shall Not Be Named. My friend and I had gone out to dinner for a girl’s night to celebrate the fact that she’d just bought her first house. We decided to walk into the local pet store and poke around after dinner. We were standing around by the front when a woman and her daughter walked in with a kitten that was barely 3 weeks old. That cat is now huge, full of piss and vinegar, and very happy to be alive. A followup on my earlier post. I do like cats but I am primarily a dog guy. 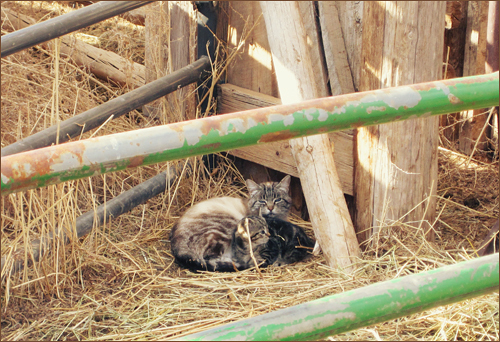 On the farm in Hermiston was Andy, a large Himalayan cat and brawler of the barnyard. one day A mouse ran across the floor while myself and 2 friends were watching TV, it ran across the floor and started up the drapes. Along comes Andy in hot pursuit,up the drapes and CRASH down came the drapes, the ensuing battle in the fallen drapes looked like a Bugs Bunny cartoon! I had a neighbor up here that had a Orange Tiger named Pyranamous. I had a dog mix of Puli and Flat Coat Retriever named Gypsy. The first time they met Pi was caught in the open and bottled up for battle and Gypsy started to trot over and stopped, she then went at high speed at Pi and just rammed him, they both shook it off and Gypsy ran and did a U-Turn and rammed Pi again, ant this point Pi was dazed, Gypsy trotted over and gave Pi a doggie face bath! I could here the 2 voices in my head: Gypsy:I just wanted to see what you are, no need to get all huffy about it. Pi: I could have been nailed! The 2 became friends and played GOTCHA one would hide in the brush and and ambush other, the winner was the one who scared the other. One day I was waiting in the yard for my neighbor and Gypsy was with me, Pi came strolling across the yard and spotted her at the same time at 50 paces. They both went rigid, then sat and then laid down staring at each other. As if by some unseen command they both got up and went about their various businesses!. Later my neighbor returned home and let Pi in, Pi was sitting on the ladder to the loft, Gypsy came in, Pi bottled and Gypsy walked up to him and got swatted on the nose with a CLOSED paw, Gypsy gave Pi a lap on the nose. To me this is a cat/dog High 5. Susan (#57) – the pics of Puck are darling. So sorry you lost her, and I hope you’re able to have another beloved cat soon. I had her from 3 months old till she was 16. I know that’s a good life for a cat, but I was hoping for a few more years. The 2 cats I had before her died at 21 and 25. Susan, sorry for your loss of Puck, just saw the pictures, Was a real beauty. For those who do not know what a Himalayan Cat looks like they have the same incredible blue eyes as Feral Kitty, and look like a cross between a Persian with the flatish nose and the markings like a Siamese, but with long hair. They are also very stocky in build. I agree with some of the other comments that animals seem to know sometimes that they need your help. One of the many cats we’ve had was Jenny, a tabby cat I brought back from Metamora, IN when I visited there with a friend many years ago. Friends of the family we visited lived at the edge of town and they had kittens living under their porch and in the barn. The mother of the one set of kittens was a three-legged cat who had been coming around for several years before losing her leg. But she had never stayed, would just show up, accept some food put out, and leave. That year, however, she had shown up with a leg missing, probably from getting it caught in a trap, they thought. She allowed them to catch her and take her to a vet, and then after healing, left again. She came back that summer after giving birth, carrying one kitten after another. She stayed on after that and seemed to understand that she needed more help with raising the kittens now that she had only three legs. The family were looking for people to adopt some of the kittens and I took Jenny. She adapted to living in an apartment very easily and was with us until our daughter was about four years old. so sweet!! I’ve recently started to feed my neighborhood cats b/c when there’s 6′ of snow, it’s a little harder for them to find mice. Anyway, the one I’ve nicknamed Curly Tail has found his (her??) way onto my porch now and likes to “chat” with one of my indoor cats. Worm (indoor cat) still isn’t sure how to react, but they both eventually sit down and just enjoy each others cat company. I did bust Curly Tail showing his belly to Worm one night as he was walking away (he was rubbing on the sidewalk), so I’m convinced he’s trying to woo her. ha. Anyway, can’t wait for the next installment! You’re so lucky to have kittens around the house! I too have a story of a stray mama cat bringing her kittens into my house. Under my bed to be exact (through my window). I was 15 at that time and wasn’t allowed to keep them, so I would take each kitten back outside to their nest, and she would just keep on bringing them back. :-) eventually I won the battle with my father and we got to keep them inside. Ended up finding a home for two of them, and keeping the two remaining ones and the mama. I too had befriended her slowly but surely by providing food and just quiet company. I love cats and felt so honored that she trusted me enough to bring me her kittens… Animals make this world so much better. Are you kidding me, ‘what did Eli do.’ she’s probably there demanding a blood test. I smell a paternity suit! What a wonderful post. Thank you Shreve. Wow, she is so pretty. She looks so like my tabby point Birman. Where on earth did she come from? Hope she and Eli become mates. love! what a beauty. your whole farmily is beautiful.